The Bristol Indie scene - an Image comic series! The idea of curse songs and how they can affect young and handsome Indie kids in Bristol may not be the likeliest pitch for a comic title. 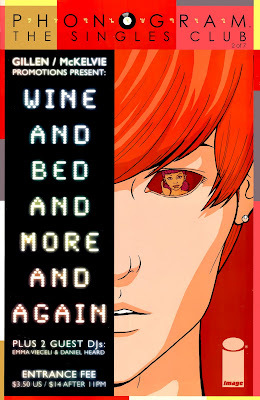 Phonogram, however, makes it all seem effortless. It puts you in the place, there is a very authentic feeling for the social mores and conventions of that particular scene. The art is clear and crisp and brings to life the pretty young things very well. There are lots of pop culture references that are helpfully explained by the writer at the end of this installment. Verdict. Never thought I would read an Image comic and get a Dexys Midnight Runners reference in it. Well, now I have. For that, and so much more, a smiling, dancing, happy 8 out of 10.